Common Sense and Service Management: What did you say? I don't hear very well...if you are standing on my right side and speak to me, then chances are that I will totally ignore you, as I have minimal hearing on that side after discovering, first-hand, what a 'sudden onset sensorineural hearing loss' is a few years back. I lost virtually all useful hearing in that ear in an instant. But, while physically my hearing is not so good, I am a very good listener. That is because hearing is really a very small part of what it takes to be a good listener. Working in IT I have come across a lot of very poor listeners, both in the business and amongst my fellow technologists, and this is a very real issue. Unless we really concentrate on honing our listening skills, we will continue to walk away from conversations with both parties having a totally different view of what they have heard. 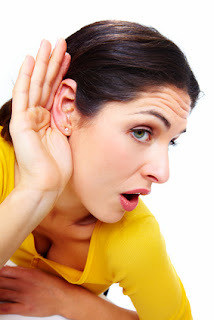 Without employing the techniques of active listening you are likely to hear just what you expect or want to hear. When both parties to a conversation have different agendas, then you are setting yourselves up for failure and disappointment. There can be very a big gap between 'what I thought I said' and 'what he heard you say'. Many a solution delivered from IT has failed, in the customer's eyes, due to that gap. Tobias Nyberg wrote an interesting article for the ITSM Review called Bring me Problems, not Solutions, this again relates back to listening and asking the right questions and finding out exactly what business problem the customer is trying to solve. I was reminded of this a few weeks ago when I had lunch with a former colleague. He is a business unit manager who has always struggled to get what he wants from IT. His frustrations have not lessened any over the years. Where he goes wrong is in going to IT with a solution - 'I need you to make the application do xyz'. The response from IT is simply 'No'. Neither party engages in a conversation. So the outcome is that the business manager and his department think IT is incompetent and IT thinks the manager is stupid, because he is consistently asking for a change that is technically impossible. Neither party, in this case, has actually taken the time to really listen to the other. Real listening involves giving the other person your full attention, noticing gestures and expressions and important non-verbal cues. Affirm what they are saying by repeating it back, ask open ended questions and WAIT for the answer. One of the biggest hurdles to overcome is your own self listening. We all do it, you are chatting to someone and they are telling you about an event that has happened in their life. All the time they are telling you about this, you are recalling an event in your life that is, maybe vaguely, related to their story. You are juggling with the details and making it fit with what they are talking about and just waiting for a chance to say 'well, something similar happened to me....' The problem is that, because you were so busy listening to your own story, you didn't really pay full attention to what you were being told and it is quite possible that you really didn't get it at all. If you are aware of this, then you can stop it, pull yourself away from your own story and actively listen to the person you are supposed to be engaging with. This relates to the practice of mindfulness. You need to be present, stop allowing your mind to wander off to different places. When you find yourself drifting, pull yourself back to the conversation. One very important technique you can use to ensure that you really come away with a full understanding of what the conversation was about is reflection. This involves paraphrasing what the person you are listening to has said, echoing it back to them and getting their agreement that this was what they meant. This technique fills two important roles, it makes you consider what they have said and it ensures that your understanding of the issue is the same as theirs. It shows them that you have been paying attention and valuing their time. If you find yourself in an important conversation in an inappropriate venue - perhaps a busy corridor, a lunchroom, or even on the street - move somewhere else, or schedule an appropriate time and place to talk so that you can give the conversation your full attention. Ask open questions, avoid any question that can be answered with a 'yes' or 'no' answer. Open questions are the ones that help you understand the business need. Instead of asking 'does it work? ', ask 'how could it work better?'. These techniques are even more important when you are dealing with someone who is hostile towards you. Nothing defuses a tense situation faster than the use of active listening techniques. Don't be afraid to use the stereotypical psycho-analysis question - 'how does that make you feel?' Sometimes that one just opens up the floodgates and starts the real dialogue about how this business issue is really affecting the person you are talking to and their team. Not saying that it always works, but if you have been actively listening and watching the cues you will have a good idea as to whether or not that is the right way to go. Listen with more than your ears - use your eyes, your mind and your body to engage actively with the other party in the conversation. You will be surprised what a bit of time spent on these skills can do for your relationships, both inside and outside of work. Even where you cannot provide the solution the customer is looking for, when they feel that they have really been listened to, the chances are that they will still walk away happy. I will be speaking about active listening and touching on mindfulness in the workplace, at the itSMF NZ conference in Auckland, NZ, May 6-8 and hopefully at some other venues globally during the year. Hope to see you there, ready to really listen!